This is a very useful piece of software I strongly recomend it. It is easy to use, well documented and it interfaces very well with my HP scanner. Excellent tool, extremely user friendly,and fast. 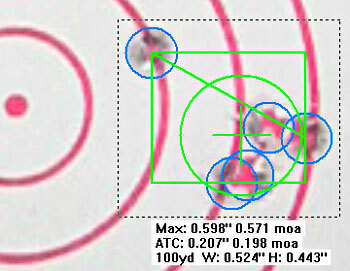 I measured a five shot group manually with dial calipiers and then used on target and was within .005 of an inch. The .005 was probably my error. The best part of the program is that it is accurate and free. I’ve been using OnTarget since June of 2009 and last year purchased the very reasonably priced version 2. It has enabled me to pitch hundreds of targets and saved hours of measuring. The targets are always available for reference. My targets are 2 to 3 megabytes per image so an average hard drive can store many hundreds. EDITOR: Here’s a tip — if you crop the target image area to just where the group has been formed you can often reduce the file size to 400kb or less with no resolution reduction. 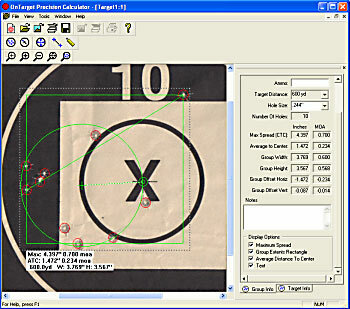 If you need a larger view of the target, you can still reduce the image size to, say, 1400×1400 pixels and that’s still adequate resolution on a computer monitor and the file size will probably be under 1 megabyte. I have tried this program in the past, and I thought that I would try it again. I have YET to get a target to measure corectly. I have measurered 10 targets that was measrued in NBRSA/IBS matches, and I can not even get close in measurement on this program to what they measured the target to, and I have measured the target to with my calipers. EDITOR: We use this program all the time and find it very useful. There are a few things you have to keep in mind. 1) If you’re working from a photograph of a target (as opposed to a flat-bed scan), the angle of the camera and the type of lens can cause distortions in the photo to be measured. 2) You need to start with a very accurate reference measurement, such as a sticker that is measured very exactly. Your group measurement can only be as accurate as the baseline reference. 3) You need some practice to get the circles perfectly centered up around the bullet holes — this takes some refinement when groups are really, really small. I will acknowledge that something like a Neil Jones tool may be more precise with one-holer groups. However, with groups of 0.3 MOA or larger, or pretty much anything you’ll get past 200 yards, we have found the program very accurate. We often use it to re-measure “wallet groups” that are sent in by readers. 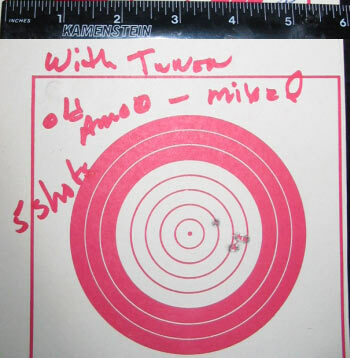 I normally find that readers “under-size” their groups because they typically subtract the full nominal bullet diameter (such as .308 for 30BR) from an outer edge to outer edge measurement. This is invalid more often than not because the holes in the paper are normally SMALLER than the nominal bullet diameter. 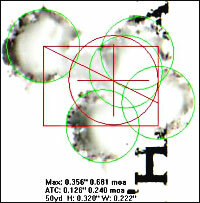 This software measures center to center, so it does NOT have this issue of getting “undersize” groups when the actual bullet holes are smaller than the stated caliber. With practice I have found the program very repeatable, and I would trust its accuracy over 95% of the group measurements we see on the web by “regular” people as opposed to experienced official target measurers using special tools. The program also has the ability to measure extremely large spreads — something that is difficult to do with something like the Neil Jones tool. But I want to re-interate that, if you start with an inaccurate baseline index measurement your end result will be off. Likewise, if the camera was not exactly perpendicular to the bullet holes, you can get perspective errors which can throw off the end result. For most guys who do not have access to a special tool or caliber-specific plugs, I think this program will probably give them BETTER results than the methods they are using now (assuming they start with a correct index measurement). Well, I have used targets scaned in on a scaner, and again I cant even get close to the measurement that was measured by the target crew at the matchs. I have tried targets scored in the low .1’s to targets scored in the .3’s and never get a measurment close to what they was scored at. 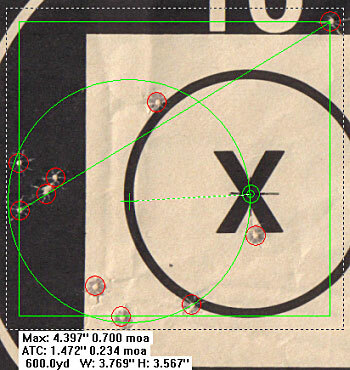 600 yard targets are too large to scan, so this leads using a camera, and again I find that the program doesn’t come up with a measurement close to what was recorded. I would agree that most shooters “wallet groups” are incorectly measured, and I will also say I have seen people with pictures scored off of this program that are obivously, not the size that they are measured. High dollar calipers are not needed, I use a cheap set of calibers purchaed from Haror freight, with a Sinclair measuring devise attached. I can usualy measure target withen a couple of thousands from what they was measured with from the match scorer. I am sure this program could be a good tool but from what I have seen, it is not spot on. It is as you have put it Operator error can and will happen. I dont see where it would replace reading with a set of calipers. Did they work out the bugs yet? Calipers are still a faster and more reliable way to measure groups. Nice gadget though. Editor: We’ve been using the program for years. It’s never crashed or locked up, so I don’t know what “bugs” you mean. Calipers are indeed fast, but if you’re measuring outside edge to outside edge, people need to remember that the bullet hole they see on paper is probably going to be smaller than nominal bullet diameter. The On-Target program measures center-to-center so it doesn’t have this issue. 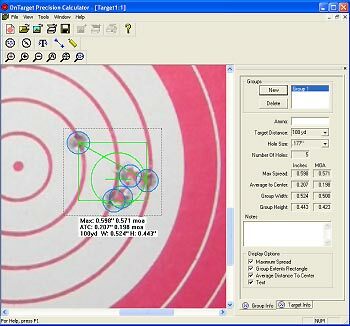 In terms of speed, the program instantly calculates actual vertical, actual horizontal, group size in MOA, and distance to center, and it places that info right on the picture of the target. When you’re measuring multiple groups that can be a time saver. As I shot for score, can I shoot, 20 to 25 individual bulls, and then calculate the over all group size with this program. Great idea. Worked very well on the test targets included with the software download. However, it appears to have several bugs. It crashes every time I try to link it to my scanner. It recognizes that it is there, then aborts and closes. I printed out one of the supplied standard targets and scanned it myself to a file. The software opened the file and recognized the target’s barcode. But when I tried to analyze it, the software spit out a bunch of error codes and crashed. Albert: We haven’t had this problem. We suggest simply scanning your target, then saving it as an image file, then opening it with On Target. We’ve been using the programs for years with XP and Windows 7 and it hasn’t crashed ever.